Our image of the week looks at the time the Spanish Conquistadors took Tenochtitlan, modern day Mexico City. We’re yet to foray closely into the history of Latin America on the site, and even though we have shared a few images, thought that we would start to make amends. Following Christopher Columbus’ founding of the Americas in 1492, European interest in the continent grew. The Portuguese and Spanish were the two European countries best able to explore the New World and set about doing so with gusto – and much violence. The Spanish Conquistadors went on to cause many problems for their ‘heathen’ foe while they were on the look out for gold. On one foray, they attacked the Aztec Empire, and eventually reached Tenochtitlan, modern day Mexico City, and laid siege to the city in 1521. 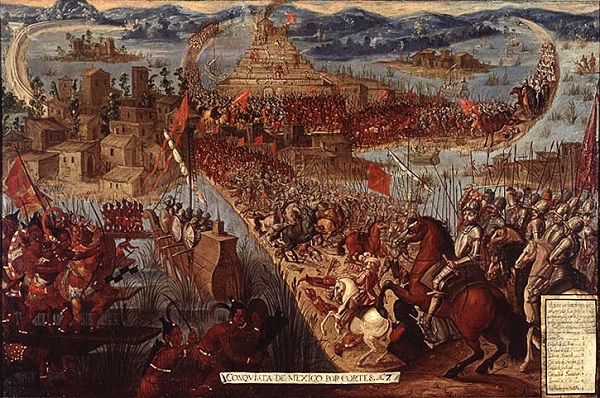 Our image shows the moment in which Hernan Cortes led his Conquistadors in a major attack on Tenochtitlan, an attack that would result in its fall in August 1521. The painting shows this mighty battle, with the Spanish, launching themselves into the city in armor and on horseback, about to cross a bridge. In the background we can see a grand Aztec pyramid and mountains in the distance.